Sometimes I need to be reminded to stop playing a game. Some games can get extremely addicting, where you constantly want to get better, richer, or more powerful. Usually, these games are just easy enough that learning how to play isn’t the problem; the problem is in putting together a strategy for the complex interaction of those basic elements. Such a game is Clash of Clans, and given the popularity of this game, I know I’m not the only one in this particular boat. Whether you’re an expert or a novice, you’ve played 10 hours or 10,000, these Clash of Clans secrets will help you dominate your opponents and get a whole lot more out of the game. I am by no means an expert at the game but from playing it a good amount and reading a ton about strategy, tips, and tricks, I’ve picked up or put together so many pointers that I think I’d be a jerk not to share. I think by the end of this you will agree that you’ve learned a thing or two, as well. Keep in mind, the tips below range from very novice to more on the expert side so take the ones that are applicable to what level you’re at. I will cover everything from gem strategy, to offense vs. defense, to bonuses you may not know existed. Before we get into the nuts and bolts of the very best secrets for CoC, I want to provide a bit of a warning about some of the other sites out there. You may notice that some sites will offer gems, elixir, etc. to you if you just fill out a survey or that you need to download something in order for the offer to work. A lot of people have commented that they are actually viruses and you will likely get a virus on your computer if you actually download the file. 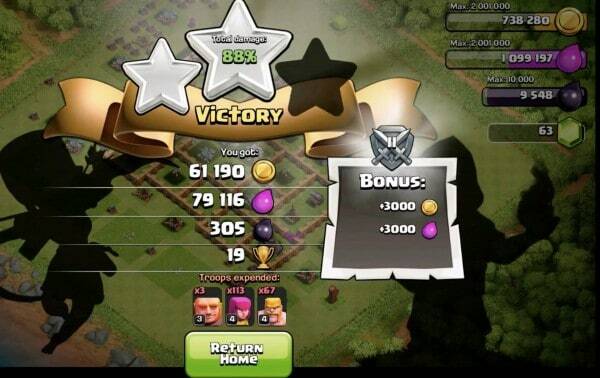 Clash of Clans is run by Supercell, which is valued at a whopping $3 billion. On top of that, Clash of Clans is run solely on their server. So, you already know that third-parties that claim to be a part of the app are trying to bilk you. If it isn’t Supercell, pass it by. And if it claims to be Supercell, do you homework to make sure. But the games all being run on their servers means more than just watching out for third parties. This means that every time you open the app then you are connecting to their server. You will not be able to trick the Supercell server into giving you a bunch of gems or elixir. They have made the app very resistant against anyone trying to take a bunch of gems. Sure, maybe you’ve found an exploit that they haven’t closed yet, but with so much revenue coming through this game, they’ll close it soon—and there may be repercussions if they determine you’ve been cheating them. On top of that, it makes the game less fun if you’re not getting resources the way you should be. C. S. Lewis said that “joy” was not in the having of a thing, but in the pursuit of a thing. Once you have a thing, the joy is over. I think this really applies to video games like this one, because a large part of the fun is in building up and working towards a goal. Once you have a magic (virus-laden, cheating) button to bring you to your goals instantly it ceases to be fun. It makes a big difference when you play the game if you’re honest. I hope with the secrets below you will not feel the need to try to trick the app. Now, let’s get into the real reason why you came to this page, to get the very best Clash of Clans secrets right at your finger tips. I hope you enjoy this guide, please share it with your friends if it’s useful and comment below with more tips and tricks. Supercell is constantly updating the game—adding new units, towers, and spells as well as new enemies and challenges to throw at you. If they’re updating, then we players as a community should be doing what we can to keep up. So post your tips, share this article, and we can stay ahead of the curve. The first secret that many people, even the best Clashers have trouble with, is to take their time when upgrading. You want to make sure your defenses are maxed out and your buildings. You absolutely don’t want to upgrade while you are undeveloped and aren’t fully ready. From my experience, upgrading too quickly will eventually slow you down in the game and sometimes can leave your village too weak to oncoming attacks. There is a sneaky way to save all of your elixir even if someone plunders your village and leaves you vulnerable. Basically if you queue more troops in your barracks and remember to maintain the queue as full as possible. Now, even if you don’t want all of the troops that are in the queue then you can always just cancel the troops and you will get the elixir back in your bank immediately. This is a great option if you’re being attacked and want to protect your resources, but make sure you’re quick enough on the draw before you get attacked and they take your elixirs. It is a good idea to try to find other players that have been inactive for a while. It can be difficult to find them depending on whether other player’s have looted them already as this is somewhat a commonly known secret. Seek out other players that have gold mines or even elixir collectors, that way you will know they have something worth your time when you loot them. Look around and try to find villages with no League Assignment associated with them. That will make them easy to raid and sometimes extremely lucrative in the end. When you’re in the midst of being attacked if your town is 40% destroyed you will automatically get a 12 hour long shield for you to recoup. You also get a shorter 4 hour shield if your base winds up being attacked so much you get down to 90% destroyed. This is a great opportunity for you to make sure you build up resources. Make sure you take this time to not attack but to build up your army and defense towers so you can be ready after the shield goes down. If it looks inevitable that you’re going down, you could always spend resources like mad and that way stick it to the attacker. A lot of players won’t always take revenge and make use of this awesome Clash of Clans secret that allows you to inspect someone’s village. The reason this is such a great secret is that you can use someone’s attack against them. Revenge is, after all, sweet. Basically, you can view and analyze your attacker’s village whenever you want. You just wait for the person to load up on a bunch of resources and then you can attack them with everything. This gives you the option to surprise attack them when they are most vulnerable, i.e. have the most open resources for looting. This may be counter intuitive but it may be beneficial at times to drop your trophies so that you can be matched against easier opponents. This is especially true if you find yourself loosing a significant percentage of games to your opponents. It’s all about trading out a small, short-term bonus for bigger gains in the long haul. The basic concept is to start a match with someone and make sure you drop your hero in so that you can drop trophies but not sacrifice your troops and elixir. Once you do that and before your hero gets hurt, make sure you quickly quit the match so that you loose. Afterward, you will loose some of your trophies and now you can play against some easier foes. A good defense strategy is to make sure you create multiple sets of walls and make sure you upgrade them as fast as possible. If you have wooden walls it’s important to keep on upgrading them, especially if you have higher level foes attack your walls. The more sets of walls there are, the more likely it is to stop your enemy when they are attacking. The dark elixir is a resource that you can get when you drill for dark elixir. You can also get dark elixir from raiding but you first need to unlock it at the town hall level 7 and again at town hall level 8. After you get a bunch of dark elixirs you can use them to upgrade your hero class troops or your dark elixir troops. The key is that you will likely max out on your gold and elixirs but not dark elixirs, so you should focus on them. Now you will have hero that can cause a ton of damage and help you when raiding. In fact, heroes are immortal but when they get injured enough they will have to regenerate. You can get the Barbarian King hero or the Archer Queen hero. As you likely know spells can be very expensive and they also are slow to produce. That means its better to make sure you save your spells for the future and not be so hasty in using them. As you continue to play Clash of Clans you will continue to fight against harder and harder enemies and it will be more necessary for you to use spells to defeat them. Therefore, it’s important to make sure you save your spells for when they’re absolutely necessary. It’s often a good idea to determine whether using a spell will actually give you the same amount of resources back or potentially more. For instance, if a spell costs 20k resources, you will want to get a good idea of if you’ll get 20k resources from your enemy or else it likely isn’t worth using. People often times are too quick to draw out their spell but if you’re smart you will save them for the real big battles. The last thing I’ll leave you with isn’t necessarily a secret but is definitely the best way to get ahead at this game. That is, to play absolutely as much as possible. You will notice that the very best Clashers around the world play the game non stop. I’m not recommending playing it that much, but the logic in it makes sense that the more you practice the better you will become at Clash of Clans. Play when you have a quick 10 minute break or for hours during the evening but ultimately the more you play the better you will become. 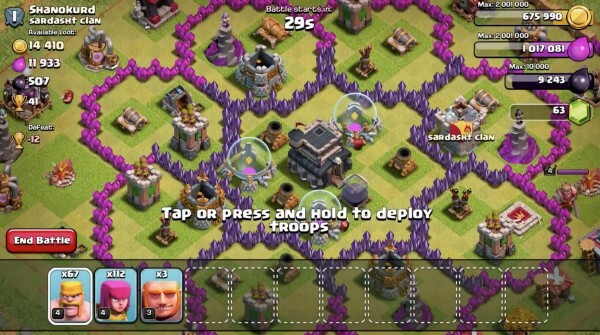 That wraps up this guide on the very best Clash of Clans secrets and hopefully will help you defeat all your attackers and foes. This is always a work in progress. Also, just because we may attack each other’s villages within the game, this doesn’t mean that we can’t be friendly outside of the game. That’s one thing I really love about Clash of Clans; the great sense of community that builds up as people share the tips that have been working for them—even if that means that those tips will eventually be used against them. Whether you’re inexperienced or experienced the tricks above allow you to get ahead in the game. Leave a comment below if you have your own secrets that you want to share with all of the readers. Also, if you found this helpful, it would be great if you share with Facebook and Twitter. I hope you enjoyed this article! And if you like other Supercell games, such as Boom Beach, or Hay Day, we’ve covered them, as well!